Awarded the first Golden Frog Award in Asian Cinema! This past weekend, KIM Jee-yong earned the Golden Frog Award from the 26th edition of EnergaCamerimage, the world’s top cinematography event which takes place in Bydgoszcz, Poland every year, for his work on HWANG Dong-hyuk’s austere siege drama The Fortress (2017). It is the first time that a cinematographer from Korea has earned the prize. Meanwhile, the Silver and Bronze prizes were picked up by Paweł PAWLIKOWSKI’s Cold War and Alfonso CUARÓN’s Roma, respectively. Earlier this year, KIM earned the Best Cinematography Awards from the Asian Film Awards and the Korean Association of Film Critics Awards, also for The Fortress. Released during last year’s Chuseok holiday, The Fortress features PARK Hae-il as the King of Joseon who confers with his ministers, played by KIM Yun-seok and LEE Byung-hun, about whether to surrender to the Qing Army invaders laying siege to their fortress. KIM Jee-yong, who spent time working in America before returning to Korea, made his debut as a feature cinematographer on KIM Jee-woon’s action-thriller A Bittersweet Life (2005). He has continued to work frequently with KIM, having shot his Hollywood debut The Last Stand with Arnold SCHWARZENEGGER in 2013, as well as his acclaimed colonial-era espionage yarn The Age of Shadows (2016). Prior to The Fortress, KIM also shot Director HWANG’s previous films Silenced (2011) and Miss Granny (2014). Other notable credits include YIM Pil-sung’s Hansel and Gretel (2007), JANG Joon-hwan’s Hwayi: A Monster Boy (2013) and LEE Won-suk’s The Royal Tailor (2014). Movie make up artist exhibition, who's specialized for historical movies. He did make-up and hair for the movie Gwanghae and The Fortress. Exhibition "Exhibition: Creating faces in movie - extensive records of Korean Movie make-up by make-up artist Cho Taehee" will be held in Dec 29th 2018 to Apr 23rd, 2019 in Ara Art Center in Insadong, Seoul. 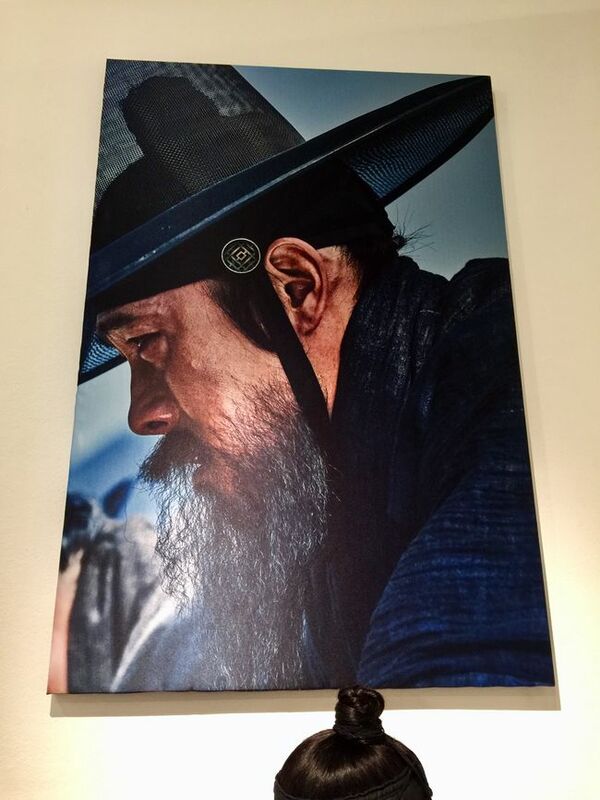 This exhibition will show concept drawings, special wigs and mustaches, accessories and other high quality make up techniques, in the movies he worked on starting with the movie "Gwanghae"(2012), The Fatal Encounter(2014), The Throne(2015), The Fortress(2017), Park Yul(2017), The Great Battle(2018), total of 15 movies and main characters in those movies. From Cho's instagram, the exhibition poster. CINE21 pictorial feat. Lee Byung Hun, Park Hae Il, Park Hee Sun and Go Soo. LBH: Wish you a bountiful Chuseok, and please watch many movies during the long holiday. PHI: We're wearing hanbok in the movie. (Banner saying, hanbok is the must for traditional holidays. everyone laughing) looking forward to seeing you in fall with our movie. Topnotch performances from Lee Byung-hun and Kim Yeon-seok. "The Fortress" is one of the movies appearing in the "Creating the Face of Cinema Exhibition" which featured the work of Cho Tae Hee, an amazing makeup artist. Make up tools used on Lee Byung Hun. 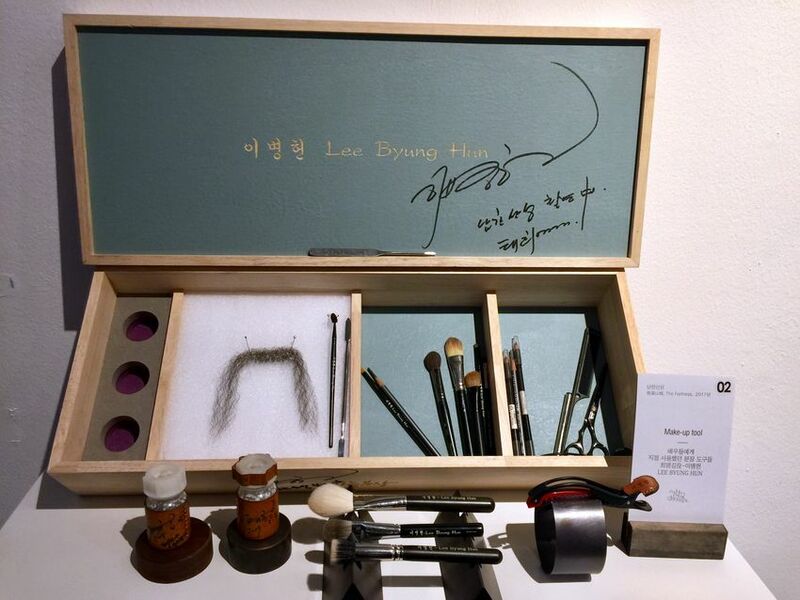 Actor Park Hae Il who played King Injo in the movie visited the Screen Drawing, Movie Make-Up Exhibition (March 26?). He took photos and left his message at THE FORTRESS section as well.